Img2PPT is a small free tool using which you can convert all the JPEG images in a folder to PowerPoint file (PPT). The program also offers option to resize the pictures based on the users input and it can place the image in the PowerPoint slide based on the users input in the place top left corners field. The JPEG files in the folder or directory should be named exactly as “image1.jpg .. imageN.jpg” as the image will be placed in PowerPoint file based on the serial number given in the file name. 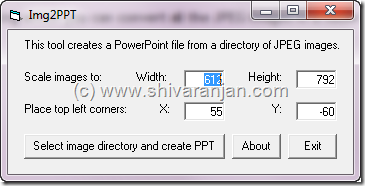 If you handle lot of pictures and present them in PowerPoint file format then this tool is a must for you. We tested this in Windows XP and Windows Vista. earth organize the human body to completely a wonderful extent.